Tusar and I were in the mood for Eggplant Parm but wanted to stay healthy. 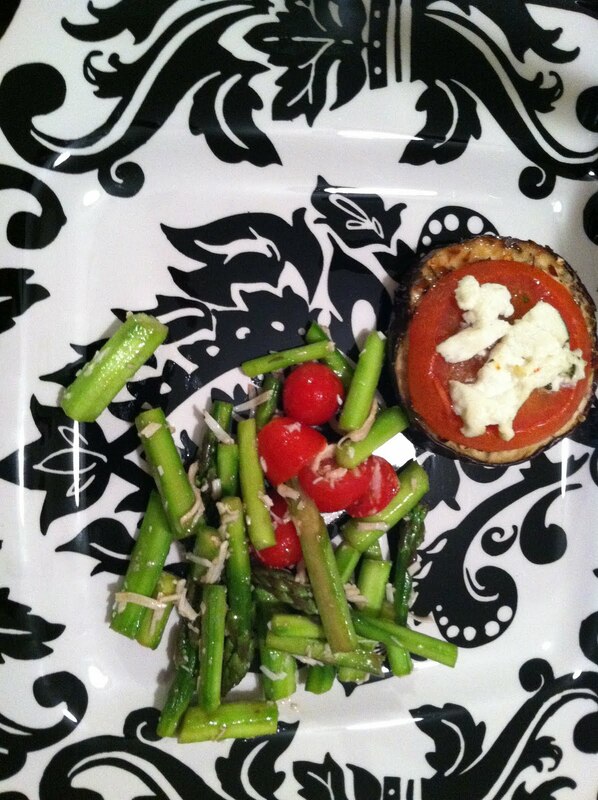 This Recipe was inspired by eggplant Parmesan but doing the following: grilling instead of pan frying; fresh tomato instead of store brought sauce; herbed goat cheese for more taste instead of mozzarella; and spritzed garlic olive oil than drizzled olive oil. Slice the eggplant into quarter inch slices. Spritz olive oil and season with dash of salt, garlic powder, red pepper flakes, and lots of Italian seasoning. Bake in the overn for 30-40 minutes or until Eggplant is cooked thoroughly. You'll know because the eggplant will brown and grow limp. Slice tomatoes into quarter inch slices and set atop each eggplant slice. Top off the tomato with a 1/2 ounce of goat cheese. Bake for another 15-20 minutes. Broil for 5 minutes at the end so that the goat cheese browns. Summer asparagus salad uses raw asparagus. It's a little more work because one would have to peel the skin off of the asparagus. This can be a little time consuming but well worth it when you are eating sweet crispy asparagus. I peeled each one and cut them up into 1 inch bites. Halve a cup of cherry tomatoes. The dressing is 1/2 of a fresh lemon, 1 teaspoon truffle infused olive oil, 1/2 tablespoon of extra virgin organic olive oil, and 2 tablespoons balsamic vinegar. Make sure to use the good olive oil and not the generic kinds from your local grocery store.